1. ATMs: To find one of our over 90,000 fee-free ATMs closest to you, visit quorumfcu.org/atmfinder, enter your address or zip code, and check the box next to “FREE ATMs.” If you have our QChoice checking account, we’ll reimburse out-of-network ATM fees (up to $15/month). Learn more here. Click on “Add/verify external account(s)” from the Quick Links menu on the right. Click the “Link External Account” button. Within three business days, two trial deposits will appear in your External Account. Once you see them, log back in to online banking. Click on “Settings” at the top right of the page, then the “Accounts” tab. Select “Confirm” to verify your External Account (you will need to know the exact amounts of both trial deposits to complete this step). Log in to online banking at quorumfcu.org. 4. 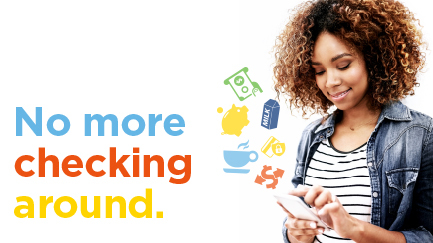 Cash Back after Purchases with Debit Mastercard®: When making purchases in person at a merchant, choose the cash back option during the checkout process. Select “Debit” after you swipe your card and you’ll be presented with the option to get cash back. Click on “Check Services” and choose the Check Withdrawal tab to access the online form. Or, you can request a check through VoiceConnect, our automated telephone service, by calling (800) 874-5544 and selecting option 1. 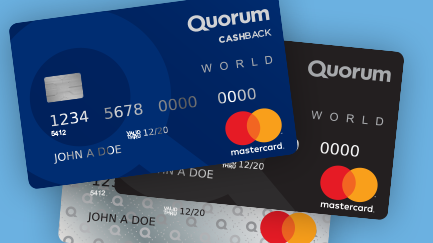 To learn more about these services and more, visit quorumfcu.org or call our Member Service Team at (800) 874-5544. Representatives are available Monday through Friday, 8:30 a.m. to 7:00 p.m. ET.